The Souls of China: The Return of Religion After Mao. Ian Johnson. New York: Pantheon Books, 2017. Ian Johnson argues, with considerable evidence, that the People’s Republic of China is undergoing a great awakening, comparable to that experienced by the United States in the nineteenth-century. This is in some sense inevitable in the generation after the Great Leap Forward and Cultural Revolution, where religions, including Daoism, Buddhism, Islam, Christianity, and especially folk religions (most of which are Daoist), were brutally suppressed. Totalitarianism led, in China’s post-totalitarian (and still officially atheist) phase, a spiritual and moral crisis that manifests itself in low social trust. In this regard, Johnson cites Peking University ethicist He Huaihong’s observation: “We can feel the overlay of savagery in our ordinary lives” (88). Johnson argues the Chinese are turning to faith as a way of filling the spiritual and moral void they experience in their culture. He combines first-rate journalism and interviewing with the most recent social science studies to show that, in discussing “China’s rise,” one must also account for its spiritual awakening that comprises, in a rough estimate, approximately 300 million believers (31). Johnson focuses on the lively activities of a handful of religious groups, including the Protestant Early Rain Reformed Church in Chengdu that is led by a former democracy advocate, Wang Yi; a group led by Li Bin in Shanxi province that is world-renowned for its musical performances of Daoist rituals; Beijing’s Ni family that is the custodian of the temple dedicated to Our Lady of the Azure Clouds, an important Daoist goddess, along with several other representative samples of religious believers. Johnson uses the term, “religion” for his Western readers but at the outset he explains this term is misleading. Researchers know not to ask the Chinese if they are religious because the answer will be overwhelmingly negative (28-29). But their response is not a sign of atheism. It is a problem of methodology and terminology because “religion” is too Western and implies something separate and alien to daily life, as well as dogma. Before the twentieth-century, the Chinese lacked a term for religion. The contemporary term, zongjiao, is a Japanese import (20-21). Instead of religion, Johnson notes that China is seeing an awakening of ritual and of faith (xinyang). He understands ritual the same way Plato has the Athenian Stranger discuss nomoi, the customs and mores of a society. Indeed, the book is structured around the annual cycle of traditional festivals that are returning. In destroying temples and suppressing rituals, Mao suppressed the social fabric of a 5,000 year-old civilization. Mao did so in order to isolate individuals from their local traditions, families, and rituals, in order to create a society where allegiance had to be paid primarily to Mao. In terms that Alexis de Tocqueville would recognize, Mao suppressed the intermediate associations between state and society. Johnson cites Vincent Goossaert and David Palmer’s claim that “a Middle Kingdom has lost its Middle” (32). Indeed, the erosion of the middle began before Mao, when the nationalists waged their modernization campaign against “superstitious” folk religions. Johnson notes that the nationalists, including Chiang Kai-Shek who was a convert, learned the distinction between true religion and superstition from Calvinism. As Protestants took to smashing idols during Reformation Geneva and elsewhere, so too the nationalists did their part to smash the intermediate, which prepared the ground for Mao’s greater destruction. Most interesting in Johnson’s account is how he sees religious groups filling the middle, constituting, and re-constituting civil society in China. Their activities in the middle are key to their success because the government does not feel threatened as long as they care for the sick, teach the young, and otherwise maintain harmony. Even so, Johnson provides lots of examples of religious groups acting as NGOs during earthquakes and other emergencies and being more effective at saving lives than government. Johnson’s discussion of civil society is most interesting in his discussion of the Early Rain Reformed church in Chengdu, although similar insights can be gained by his study of the Daoists and others. Early Rain’s name is taken from Deuteronomy 11:14. It is led by Wang Yi, a former advocate of democracy, civil rights lawyer and blogger, whose life now as pastor seems both a break from and continuation of that work. He is a bit like Augustine, who went from rhetorician and public intellectual to one of Christianity’s greatest preachers and philosophers. Wang’s life as pastor also breaks from his previous life because he no longer openly advocates for democracy nor identifies with the democracy movement, many of whose members have been jailed, including Liu Xiaobo, the 2010 Nobel Prize winner who died in custody in June 2017. Instead, he said it was about God revealing himself through Jesus. It started with individuals’ taking responsibility for their own actions, he said, and it started with the Greek verb “to be.” And then he began to recite. Wang Yi and others like him are reconstituting public space in China as the place where individuals share a common life in which they take responsibility for their own actions. Though their actions take place in civil society, theirs is a reconstitution of the basic meaning of politics as it has come down to us from the discovery of politics in ancient Greece and transmitted through the writings of Plato and Aristotle. But because politics cannot be conducted at the level of politics, it must be conducted in the life of faith in civil society. Wang spreads the Gospel of “I am” in the same manner that, as the former Pope Benedict explained in his Regensburg Address, Paul and the early Christians transmitted the Gospel through the lens of the Greek experience of the logos. It is not all metaphysics and learning Biblical Greek (though it is that too). Early Rain’s Calvinism places emphasis on the Word more than on ritual. However, it is led by presbyters like Wang Yi who wield considerable authority, and its members deliberate matters like the Heidelburg Confession and vote on matters like infant baptism (286-87). In describing the manner in which they run their church, Johnson describes a kind of constitutionalism, almost a miniature of what Aristotle would recognize as a mixed regime. Even so, Calvinism is appealing because it “is the only holistic worldview in Protestantism” that can replace Communist ideology (292). It is superior to Roman Catholicism because Protestantism is decentralized (no reporting to Rome), can claim to be authentically Chinese in the sense that its ideas are transnational and transcultural, and it does not overtly challenge Beijing rule. Johnson also describes some of the ways they operate under and around the gaze of the government (337-38). Wang Yi’s transmission of the Gospel is aimed beyond politics to the person of Jesus, and thus cultivates a humanity rooted in deepest spiritual wells that helps explain the resilience of Christian communities that have faced persecution, including those during the Mao era. 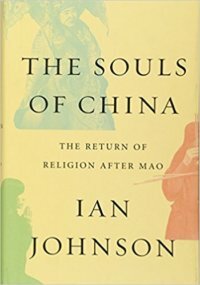 A friend of Wang tells Johnson how effectively Christians held out against Mao during the Cultural Revolution: “They were much more courageous than the intellectuals. They were the toughest, the strongest. They succeeded. The intellectuals failed” (163). By acknowledging the root of the person beyond politics, the Gospel has a political effect insofar as it creates a built-in resistance against political power that threatens the dignity and rights of the person. One could say that, in the terms of David Walsh’s most recent book, the politics of the person is being played out in China. The politics of the person, rooted in “I am,” is the politics of persons exercising their reason on the wings of faith to conduct their common life together. Ran Yunfei, an intellectual, explains to Johnson that public debate in China is generally uncivil, full of insults, and “trashy” (65). It is dominated by the party and so it is dominated by the ideological lie of materialistic secularism. Johnson comments: “Public spaces tended to be like this in China — littering, spitting and abusing public property were the rule; after all, there was always a migrant laborer to sweep it up” (62). Lack of harmony, of social trust, is a widely-held concern in China (88-90). So too is a society in which “friend” means someone who, in the style of the Mafia, owes you a favour (or you owe him a favour). “Hidden rules” (qian guize) guide favoritism, hidden connections, and unethical deal making. Post-totalitarian China lacks political friendship. Instead “harmony” consists of oligarchic opportunism and clientelism. Ran Yunfei explains life in the ideological lie: “This is destructive; it destroys everything you’ve been taught. You feel that nothing is real. How can they teach the virtues? It’s impossible. You find out that the things you’re supposed to admire the most are fake. So it seems nothing is real. Faith is a foundation, but the government has no foundation: they will say anything or do anything. The only way the party can succeed is by cheating you. That becomes their biggest success —by how much they can cheat you. That’s whom you’re ruled by” (66). The rituals and expressions of faith that Johnson documents are ways of combatting the ideological lie and of regaining reality in post-totalitarian China. Instead of the lie which effectively teaches that injustice is better than justice, “faith can be a simple proposition: doing good deeds and living a straight life” (66). Yet in the case of Wang Yi’s Early Rain church, faith is more. Faith rooted in the “I am” forms the wings on which the reason of the person flies. Ran Yunfei explains to Johnson that in addition to the good NGO and civil society work done by churches, they teach people to think (65). Johnson notes that many Chinese public intellectuals— Liu Xiaobo is the most prominent— do not subscribe to the Enlightenment myth popular among Western intellectuals that faith and reason are incompatible. This is because they have had to live under an aggressively secular, materialistic tyranny but are also impressed with the virtue of the persecuted believers. Faith, in Johnson’s telling, is less about dogma and more about the transcendent order of being that sustains the person amidst the earthly wasteland. Theirs is a faith wherein ritual and reason approach the transcendent mystery of the person in its full amplitude that no government can touch (398-400). In October 2017, Radio Free Asia reported that Chinese authorities detained Wang Yi from entering Hong Kong to attend the Three-Fold Christian Conference. They also detained other members of his congregation in Chengdu and prevented other churches from worshipping. This coincided with the Communist Party’s five-yearly congress in Beijing where Xi Jinping secured additional powers that elevated his status in the party pantheon to that of Mao and Deng Xiaoping. Once again Caesar persecutes followers of Jesus. Johnson cites Hebrews 11:16 as an epigraph to his study: “But now they desire a better country, that is, a heavenly one. Therefore God is not ashamed to be called their God, for he has prepared for them a city.” As with Augustine who appropriated this idea for his City of God, the search for the city of God is not so much an escape from the earthly city as it is a prayer for its reconstitution. Plato, “Epistle VII,” 325d, in Plato’s Epistles, trans., Glenn R. Morrow, (Indianapolis: Bobbs-Merrill Company, Inc., 1962. On the discovery of politics, see Jürgen Gebhardt, “The Origins of Politics in Ancient Hellas: Old Interpretations and New Perspectives,” in Sophia and Praxis: The Boundaries of Politics, ed., J.M. Porter, (Chatham, NJ: Chatham House Publishers, Inc., 1984), 2. David Walsh, The Politics of the Person as the Politics of Being, (Notre Dame: University of Notre Dame Press, 2015). John von Heyking is a Board Member and Book Review Editor of Voegelinview as well as a Professor of Political Science at the University of Lethbridge in Canada. He is author and editor of several books, including The Form of Politics: Aristotle and Plato on Friendship (McGill-Queen's, 2016) and Comprehensive Judgment and Absolute Selflessness: Winston Churchill on Politics as Friendship (St. Augustine’s, 2018).